AC Servo Assembly Tools | CORETEC Inc.
Utilizing technical skills and experience accumulated over many years, CORETEC offers proposals that include the best, most suitable equipment and system configurations. In addition to being compact, these tools offer high-precision, high-performance appeal. These tools have a long, extensive record of delivery in a variety of fields. Using tools that are compact and controllers that support a variety of controls, CORETEC provides a great sense of security and satisfaction in its production efficiency and quality improvement on the assembly and manufacturing line. Compact size: Industry’s smallest and lightest! 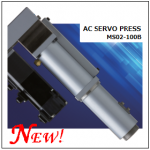 AC servo press low-thrust 2kN model has arrived! Actual size when printed on A4 paper! See for yourself! CORETEC knows everything about production equipment, and has proposed the servo press described here. CORETEC is an expert in the area of thread fastening, and is offering the nutrunner described here. Attachments for nutrunners are introduced here. Feb-26-’16 A compact low-thrust 2kN model AC Servo Press “MS02-100B” has been released! Nov. 2011 We acquired a patent for the AC Servo Press. Oct. 2011 IPS Nutrunner Controller is now a service part. Due to the earthquake disaster, it has become impossible to obtain key parts; therefore, production will be suspended. An introduction to the CPS-NR-75, successor to the IPS, will be provided. May 2009 Servo Press 15th Year Anniversary Campaign is underway!! A special discount price has been set. The price being offered is quite attractive. Apr. 2009 The IPS Servo Press Controller and Servo Press Tool SP Series became service parts in April 2009. Jul. 2008 The BS/CS Series complies with European Safety Standards (CE Marking). Apr. 2008 New transactions involving the IPS Servo Press will end in March 2009 as sales of the new type begin. Production is scheduled to end in Mar. 2010 Maintenance service will be provided for 7 years after production ends.